The ordinarily gentle Megalosaurus myronius is threatened by a foreign presence and bares her razor sharp teeth as a maternal instinct to protect her young. 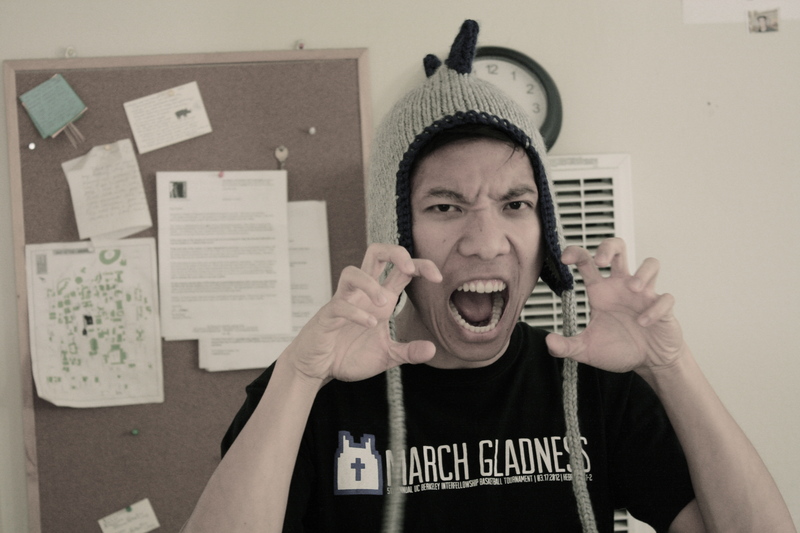 This is my roommate, Myron, doing what he does best around the apartment: looking like a dinosaur. I know none of us have ever seen an actual dinosaur, but let’s be honest, he looks like something straight out of Land Before Time. And before you all start judging me, let me just say that Myron is totally fine with the comparison. He understands that he has the bone structure of a Brontosaurus. He even embraces it (well, not the Land Before Time crack, I’m pretty sure he’ll hate me for that). 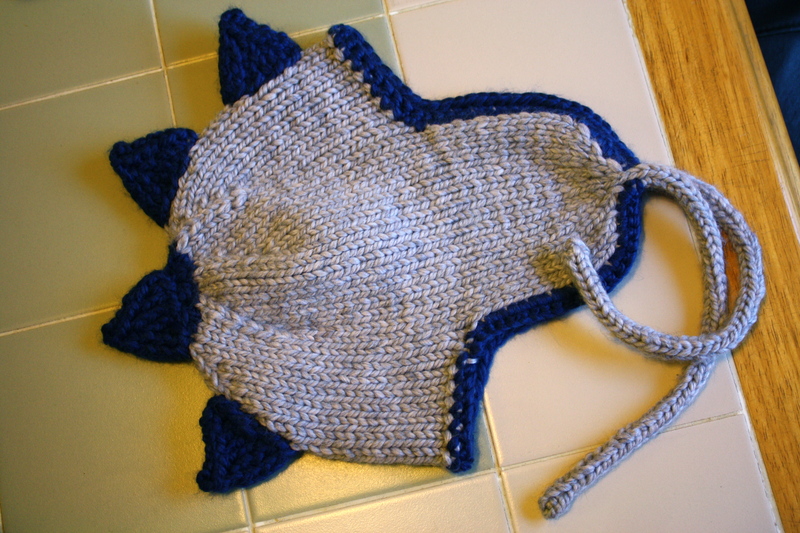 So much so that he had me knit him a dinosaur costume for Halloween! Now, as much as I would love to express my creativity through a knitted dinosaur onesie, I have neither the time nor the vast quantities of yarn required to make a 6 foot tall knitted jumpsuit. So, after a heated argument and some tears (Myron really wanted a onesie), we finally decided on just the dinosaur hat, with Myron acting out the rest of the outfit. Only after she has been given huge quantities of tranquilizers is one safe enough to near the elegant Megalosaurus myronius and admire its majestic beauty. Does the hat strike anyone as familiar? If so, then congratulations for remembering my very first post ever! This dinosaur hat is essentially an augmented version of my deerstalker hat! With some minor adjustments, I eliminated the ribbing border and increased the circumference by a few inches, and ta-da! You have yourself a baseline for any animal hat you can think of. 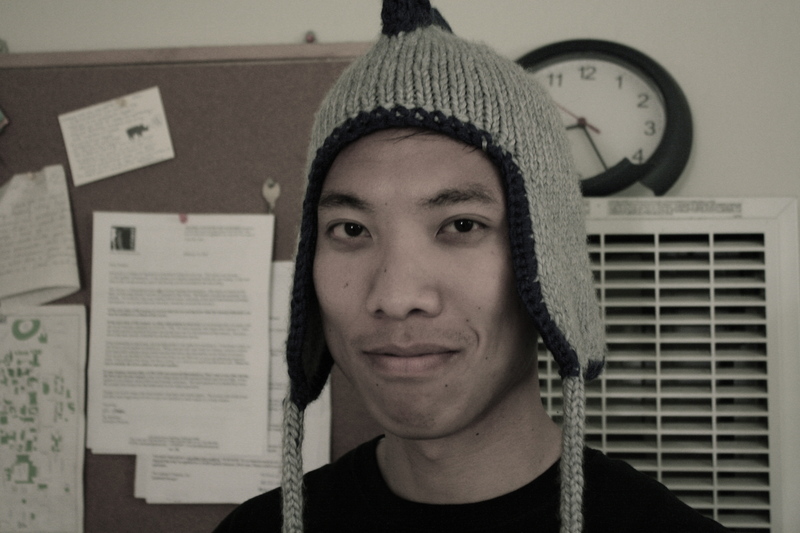 For a dinosaur hat, I decided to knit tiny triangles for the spikes and then crochet a matching border around the brim to make this hat slightly more fashionable. Quick tip for all you knitters out there: If you haven’t yet, I highly recommend learning the basics of crocheting. Not only is it a fun and easy alternative to knitting, but it makes for nice, even borders, since knit cast-ons and cast-offs can sometimes look messy. Also, for severe cases of “oh my god I dropped a gazillion stitches!” crocheting provides an easy way of picking up stitches vertically! 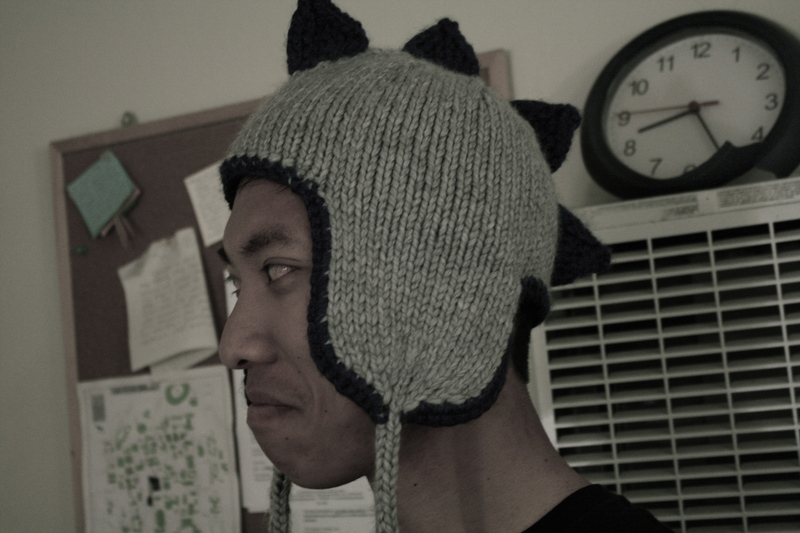 I know grey/blue isn’t the first color scheme that comes to mind when one thinks of dinosaurs, but my roommate wanted something wearable in public when he went to Asia (again, Godzilla jokes are failing me), so I chose these colors, making this dinosaur hat approximately 35% ‘dinosaur’ and 65% ‘hat’. At last, the Megalosaurus myronius lowers her primal defenses, no longer seeing the foreigner as a threat, and returns to nursing her young. I am what you could classify as a two-timing knitter. I’m not monogamous, like other knitters who will sit on their porches for hours just enjoying the act of knitting, reveling in the process (one can only dream). No, I’m more like a married man with a mistress. I have my own routines and responsibilities to take care of, but I like to dabble with the double-pointed needles (knitting an affair-isle sweater, perhaps? eh? eh? Pretty good, right?) when I can, because it makes me feel alive and vigorous again (just go with me on this). 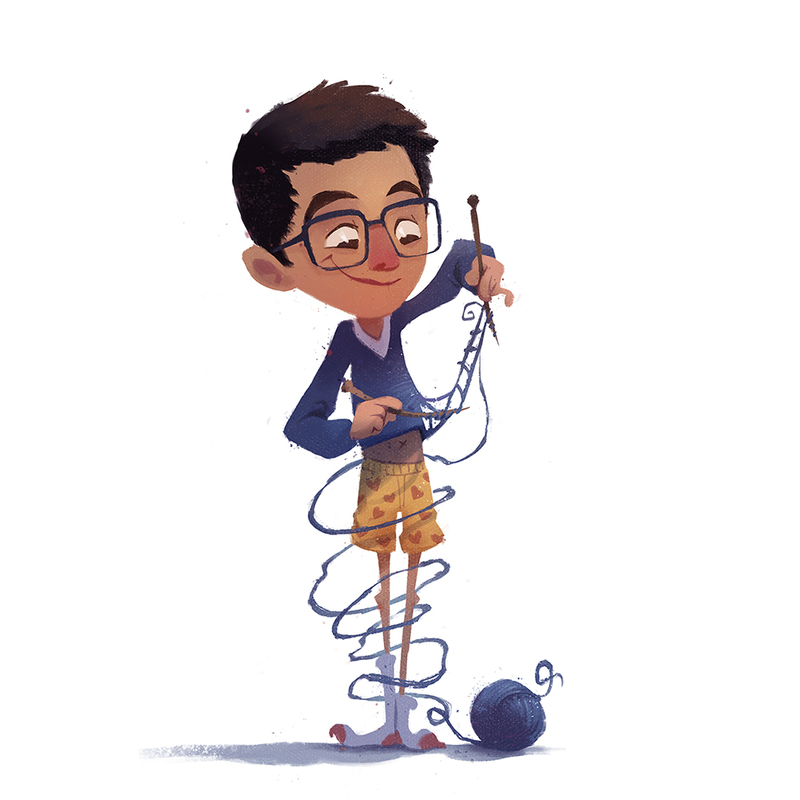 I never just knit to knit, because I always have more important things to do like school or work. So, I’m forced to carry my stash with me at all times, and grab a quick few rows on the bus on my way to work. And this arrangement would work out perfectly if it weren’t for one thing: Public transportation through Oakland at 8pm is where crazy happens. I’ve definitely had to become more cautious about when it’s safe to pull out a project I’m working on. There are just some people who you know will snap your needles in half (is it sad that this is an actual fear of mine?) if given the chance. Fortunately, as of now, I’ve only had to endure awkward stares from high school students and slurred encouragements from overaged drunks. Now, I later learned that she was actually returning her bike to her brother, who was going to pick it up from the corner that she dropped it off on. Why she had to deliver the bike à la The Hulk I have no idea, but nevertheless, crazy, right? All this to say, there are hazards to holding your extracurriculars on a public bus, whether it be evil needle snappers or lady bike throwers. But, what can I say? I have to squeeze in my guilty knitting somewhere. I say, as long as my boss doesn’t find out about my evenings with a $5 crochet hook, then I should be fine. *** “Baba O’Riley,” often mistakenly called “Teenage Wasteland,” is a song performed by the English band, The Who. It comes from a combination of Meher Baba and Terry Riley, the song’s two influences.